Rasheda and Sephoroza, both 14 years old, are two shining examples of the transformation that’s possible when girls receive an education. If you met them—Rasheda shy, incredibly intelligent, and Sephoroza, bold, and always positive—you would be surprised to know that both girls almost dropped out of school last year. Waterborne diseases, tiring walks for water, and missed school days made it almost impossible for them to keep up with their studies. They nearly gave up. Today, they’re leading their schools and making change in the hardest-to-reach rural villages of Uganda. Rasheda Nangobi lives in Busaala village with her grandmother. Families in Uganda must pay school fees, and Rasheda missed so many days from waterborne illnesses. For lack of adequate bathrooms in her school, she skipped an entire week a month. It would have been easier and cheaper to drop out. Globally, 12 million girls a year are married before the age of 18. Rasheda knows many girls who have dropped out of school and become child brides. The bride price from the prospective husband is a desirable source of income for families in need. The life of a young bride is not what Rasheda wished for herself, and she fought to stay in school. 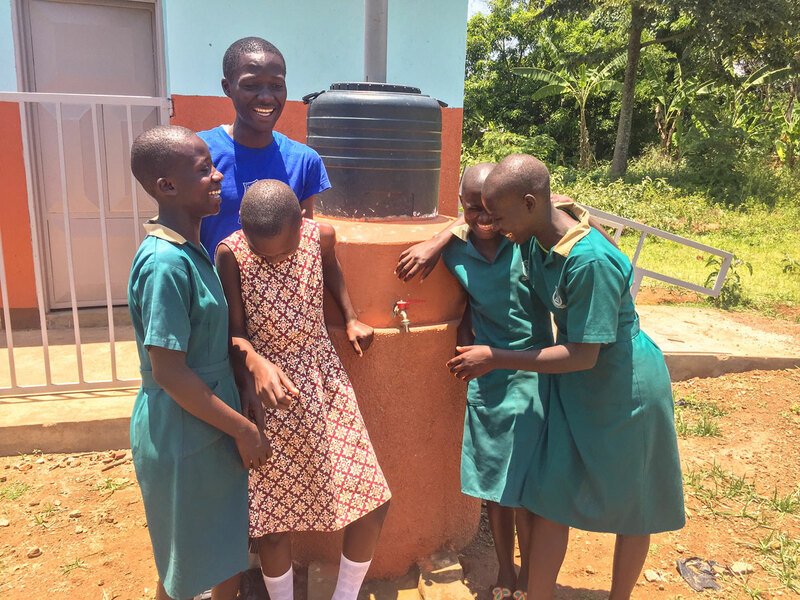 Today, Rasheda attends Busaala Primary School, where Lifewater partnered with the PTA and local government to build a safe water point, handicap-accessible bathrooms with changing rooms for girls, and a permanent handwashing station. Rasheda reads the inscription on her school’s new rainwater harvesting tank. Busala Primary students used to walk miles to reach a contaminated well in a nearby village. “It would be mostly girls who were chosen to fetch water… the long distance also meant we returned to school tired which made it difficult to concentrate and learn after,” she said. Busala Primary now has their own rainwater harvesting tank on the premises. Rasheda has the best grades and the most influence out of any of the girls. She’s also an active member of her school’s WASH club, a group of student leaders dedicated to encouraging hygiene and sanitation practices. After school, she teaches families in her village how to practice healthy habits. Disease has reduced, more children are going to school, and Rasheda is an inspiration to all. “My life is better because we have enough safe water to drink,” she said. Rasheda wants to be a teacher when she grows up. With safe water and bathrooms, she’s pursuing her education. Sephoroza Naigaga lives with her nine brothers and sisters in Nakibungulya village, Uganda. She attends Bwiite Primary School, where Lifewater and community members have helped construct handicap-accessible bathrooms, water tanks for storage, and permanent handwashing stations. Before Sephoroza’s school received safe water, she remembers sparsely attended classrooms and villages ill from waterborne diseases. Sephoroza stands proudly in front of her classroom. 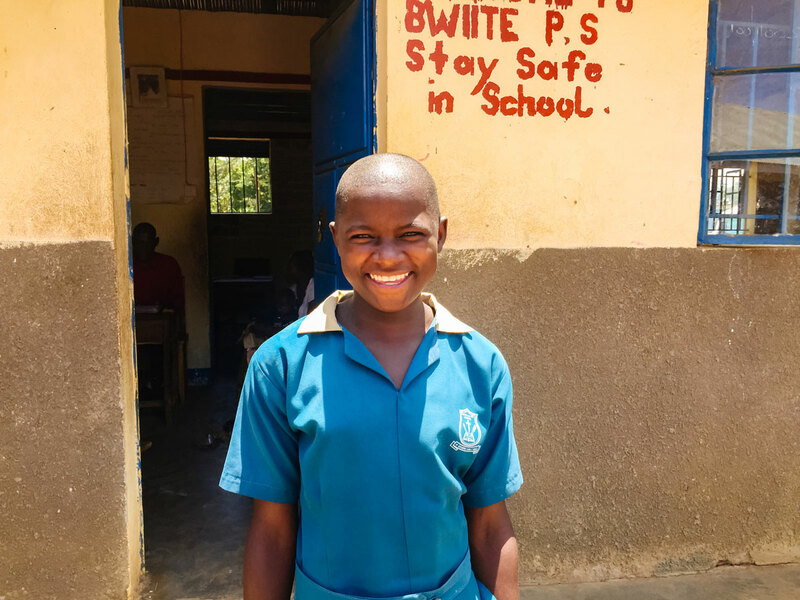 Today, Sephoroza is the Sanitary Officer at Bwitte Primary; she drafted and now manages the cleaning schedule for the bathrooms and classrooms, and she leads her school’s WASH Club. Sephoroza’s duties don’t stop when she gets out of school each day. Since learning about WASH practices at school, she has taught every household in her village how to live healthy lives. She convinced her neighbors that they would save money on health costs and keep their children in school if they could only live healthier lives. It worked. Sephoroza’s village has not only become visibly healthier, but they can now save money and become financially independent as well. Because of her leadership, more children in Nakibungulya village are able to go to school; their parents can afford their tuition. Sephoroza and friends joke around their permanent hand washing station. At 14 years old, Sephoroza is a community leader and a health advocate. She isn’t certain what she wants to be yet, but she knows that since getting safe water, she can do so much more. There is a determination and an authority about Rasheda and Sephoroza. Every household in their village knows them by name and observes their guidance. They are girls with an education, girls with clean water, and they are the future of Uganda.